According to a report published in the Journal of the American College of Nutrition, “tea is the most consumed drink in the world after water.” Green tea, in particular, serves as a daily staple with many communities around the globe. Lauded for over 100 years for its multi-fold health benefits, green tea is much more than just a delightful beverage. It has for centuries been the essential daily elixir in Japanese culture. On the Island of Okinawa, Japan, green tea is consumed with most every meal. One might correlate this ubiquitous tea consumption to the fact that the residents of Okinawa enjoy one of the longest and healthiest life spans of any community in the world. There are numerous varietals of green tea, which is cultivated from a small evergreen shrub or tree. The scientific Latin name of the plant from which green tea is harvested is Camellia Sinensis. Most commercial green teas we are familiar with today are made of leaves from one variety of Camelilla Sinensis or another. The exact origin of green tea is unknown, but most scholars believe it was likely China since much of it is sourced from that country. You may enjoy green tea because it contains a modest amount of caffeine, which helps provide energy throughout the day without shocking the system. You are also (maybe, unknowingly) enjoying its abundant other beneficial attributes. Green tea leaves are not fermented, therefore allowing the highest concentration of antioxidants to be preserved. Green tea retains about 30 percent flavonoid antioxidants, polyphenols (which can also be found in blueberries, dark chocolate and red wine) and catechins called EGCG. These powerful compounds assist the body in neutralizing free radicals that cause aging and the eventual decline of cellular health. In 2008, the Mayo Clinic released their findings on the benefits of green tea consumption which include: aiding in the prevention of memory loss, reducing the risk of heart disease, helping to lower blood pressure and cholesterol and reducing inflammation from arthritis, as well as improvement in bone density. Just a handful of additional known benefits attributed to the consumption of green tea include boosting metabolism and helping the prevention of eye disease and strokes. While certainly delicious, there are also numerous attributes for green tea beyond consumption alone. 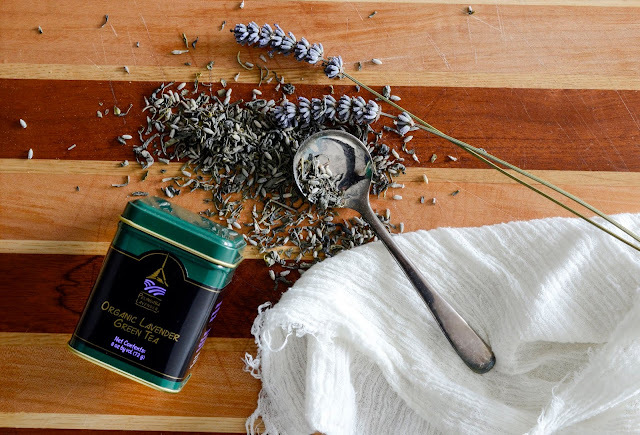 Pelindaba Lavender’s Organic Lavender Green Tea is a distinctive combination of our Organic Culinary Provence Lavender blended with the Lucky Dragon varietal of green tea leaves. Featuring a pleasantly piquant aroma and taste, our Organic Lavender Green Tea is an enduring favorite among tea aficionados. 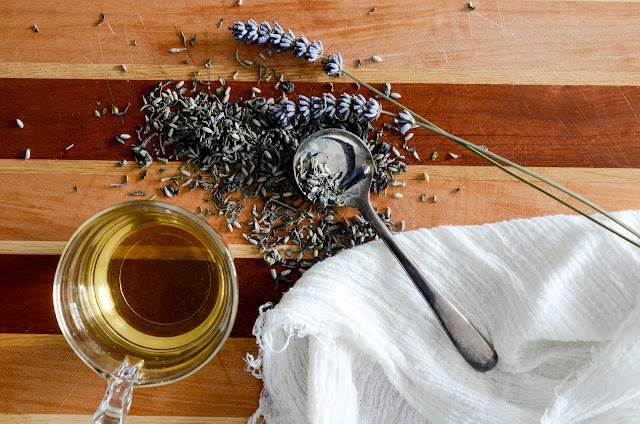 Served just as it is or with our Organic Lavender Gourmet Honey, enjoy a cup while curled up with a good read for a warming long winter’s eve libation. Add to any smoothie in place of milk or juice for a healthful boost. It is particularly delightful as an accompaniment to flavors such as ginger, vanilla, tropical fruits, peach, strawberry, mint and even chocolate! During this winter season fraught with all manner of colds, flus, and viruses, why not try adding this wonderfully healthy and refreshing beverage to your daily intake? Moisturizing your body's largest organ is a need that is especially important during this blustery season. Winter's dry, frigid air can really do a number on the skin! Moisturizers lock in water and protect the skin from irritants such as cold weather and dry climates. Using a moisturizer daily can help prevent such irritations and this is something you don’t want to skimp on when a frosty wind is blowing your way. Still, no matter the season, moisturizing your skin should be a top priority in your daily routine. Who doesn’t want soft, supple, silky smooth skin? Taking just a few minutes daily to apply your preferred moisturizer will help fend off dryness linked with itching, dry patches and will keep your skin hydrated. To help you find the moisturizer that works best for you, we selected some of our favorite products to help fight dry skin throughout the season. 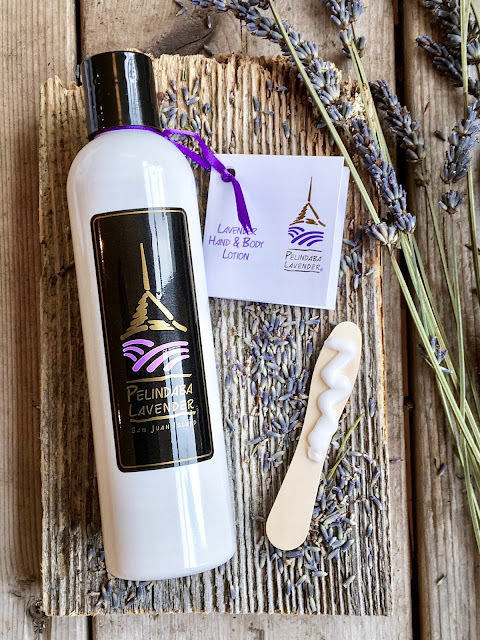 The inclusion of lavender essential oil to Pelindaba's skin moisturizing products brings added natural antibacterial and disinfectant benefits to this necessary daily skin care routine. Our certified Organic Lavender Essential Oil and Hydrosol are blended with a selection of organic natural oils and plant extracts to create our paraben-free Lavender Hand & Body Lotion. These ingredients assist in hydrating and rejuvenating all skin types. The nourishing oils will be absorbed very quickly, giving the right amount of moisture to the skin and leaving it feeling silky smooth. Apply generously after washing hands, showering or bathing, or whenever the skin feels dry. Our Lavender Body Oil is a wonderfully fragrant natural skin moisturizer that can be used for the body and the face. For use after bathing or showering or whenever an oil rather than a lotion is preferred. Apply in small quantities and allow to soak into the skin before dressing. 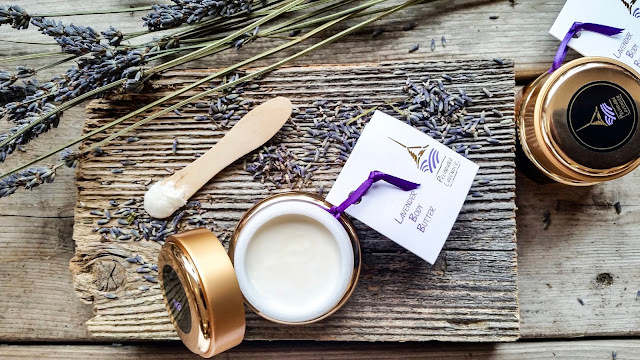 Lavender Body Butter is a luxurious firm cream that continues to grow in popularity as a general facial moisturizer and as a particularly effective skin softener for hands and feet. The principal ingredient, organic shea butter, is derived from a tree that grows in the wooded savannahs of West Africa. 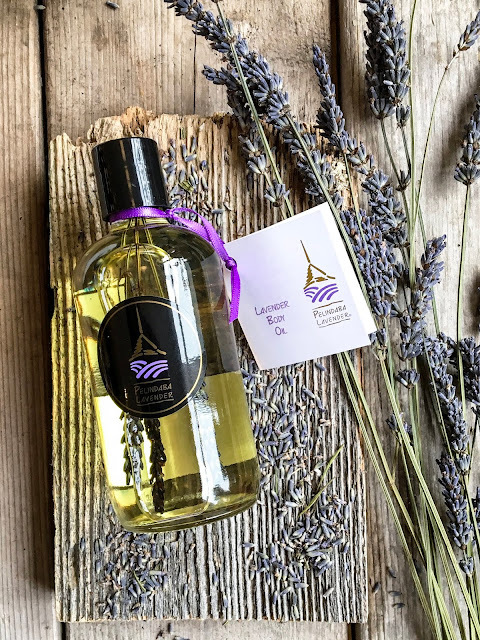 With the addition of our Organic Lavender Essential Oil and other natural oils, its beneficial properties are enhanced (and its fragrance made irresistible!). This thick, rich cream will melt luxuriously into the skin, leaving it smooth and soft throughout the day and night. 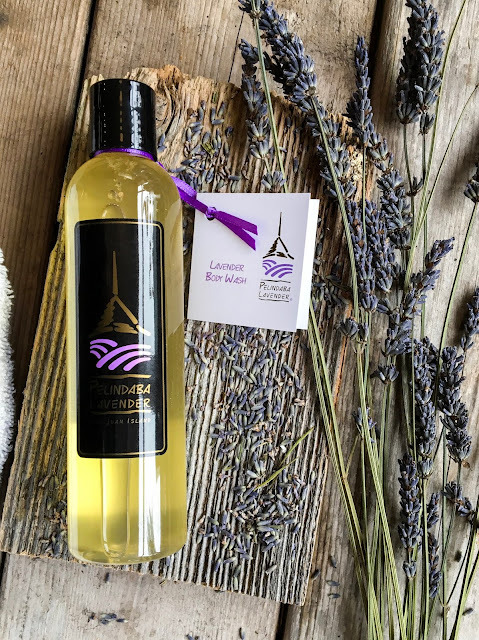 Our Lavender Body Wash is specially formulated to take full advantage of the cleansing and moisturizing properties of several organic plant oils. It lathers very nicely and leaves your skin fresh and moisturized after a shower. Gentle enough for all skin types - including infants and children - and has no added thickeners or fillers like gluten. 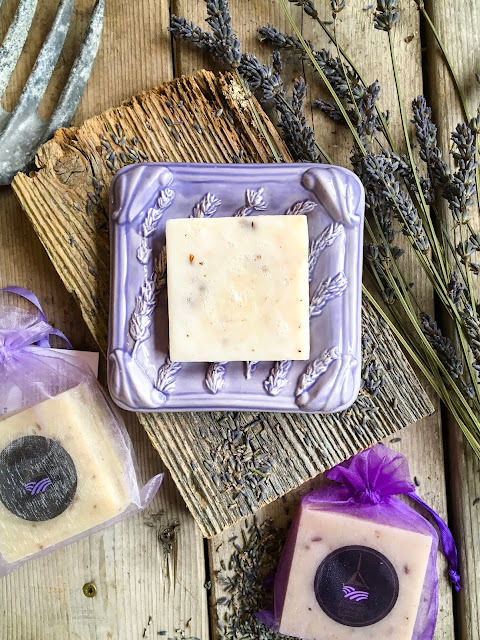 The blending of six additional vegetable oils and shea butter, ensures this soap bar is soft yet cleansing, with superior moisturizing qualities and a wonderful lavender scent. This gentle soap is suitable for use anywhere in the home or if you are washing your hands frequently at work. Continue the lavender theme with a handmade ceramic Lavender Soap Dish made by local San Juan Island artist Lauren Jawer. As we do not use any synthetic preservatives in our lavender soaps, it is best to store them in a slotted or raised soap dish like these lovely dishes so they do not sit in water between uses. Whether you have a preference for balms, lotions or oils - the important thing is to take care of the skin. A little time, a little effort and a good product used daily will yield wonderful long-term results that your older self will thank you for! 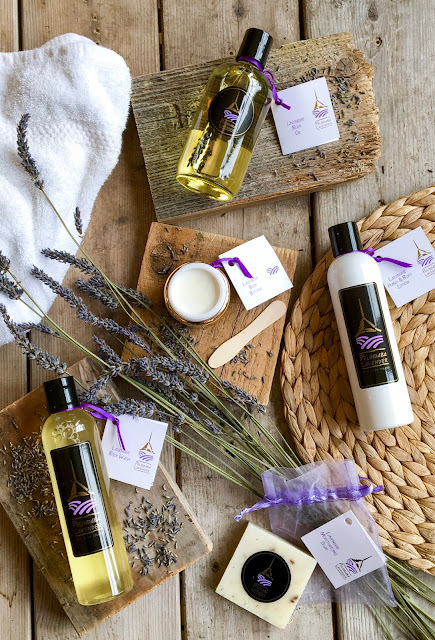 For those with more acute skin concerns like cold sores, eczema or even those undergoing radiation, our line of lavender-based therapeutic skin care products is well worth a browse. One of the most widely enjoyed culinary lavender pairings is lavender and chocolate. For chocolate lovers and lavender lovers, the pairing provides a unique taste adventure of slightly sweet floral notes that blend beautifully with the deep, rich notes of chocolate. 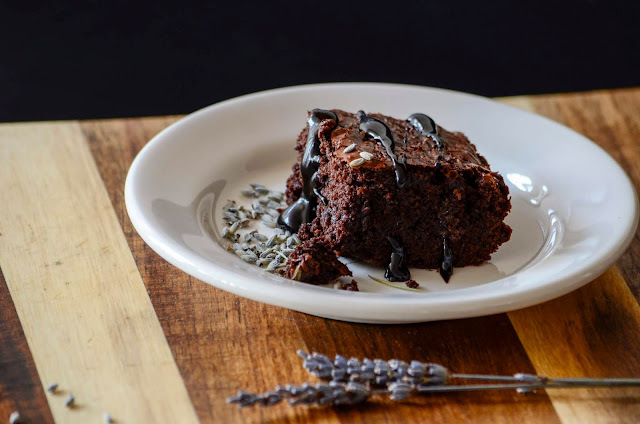 Joined together as Lavender Brownies, the two loves create a delightful treat that will satisfy your sweet tooth with their delicious combined flavor. And, you won't believe how simple they are to make! Create a new tradition with your beloved little ones and add a touch of lavender to your family Valentine’s Day festivities. Although non-traditional in modern Valentine’s Day celebrations, there are bountiful lavender-based sweets and treats that will surely bring a delighted smile to a child’s face. From after-school snacks to bath time treats, try one or enjoy them all! 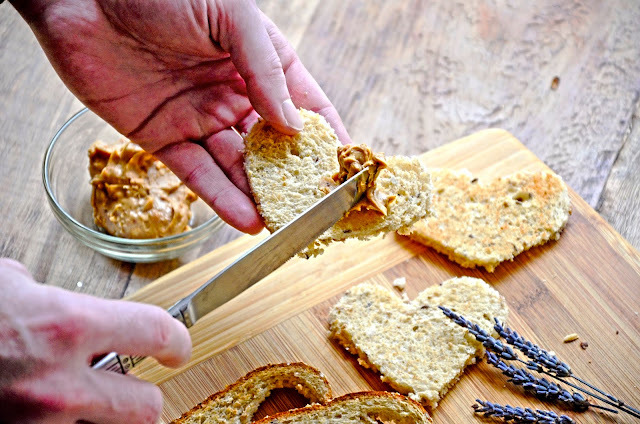 Create a twist on a classic peanut butter and honey sandwich. 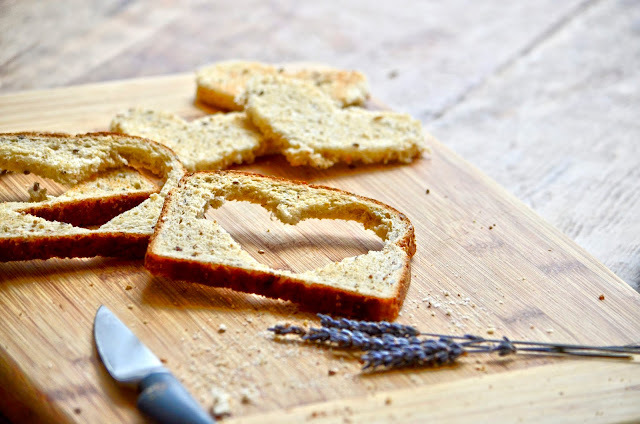 Cut sliced bread of choice into heart shapes using an open metal cookie cutter or sharp knife. 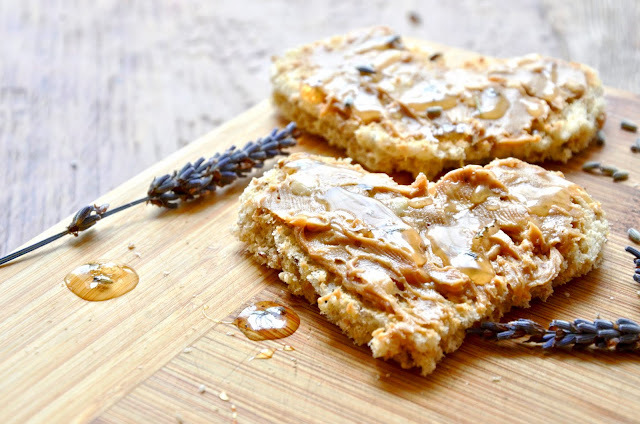 Spread one side each of heart cutout with peanut (or other nut) butter and Organic Lavender Honey and press together. Add a dollop of strawberry jam for an extra delectable sandwich. 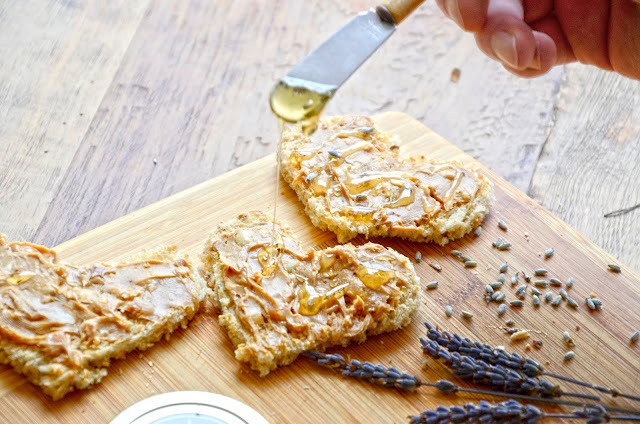 Infused with our organically certified lavender flower buds, this wonderful certified organic wildflower honey from Brazil is also delicious on toast and scones. If a light dessert or snack is desired, try dipping strawberries in Lavender Bittersweet Chocolate Sauce. Our delicious chocolate sauce is produced in small batches with European-style (Dutch Process) cocoa powder. Dutch Process cocoa produces a mellower flavor and darker color than other processed cocoa powders. It is also vegan and dairy free! For a truly decadent dessert, assemble an ice cream sundae with ingredients of your choosing and top with a generous spoonful of Lavender Bittersweet Chocolate Sauce and a cherry. Strawberry sorbet or cherry ice cream are particularly luscious with our Lavender Bittersweet Chocolate Sauce. If Valentine's Day is particularly chilly outside, serve Lavender Gourmet Hot Chocolate with a sweet, colorful twist. Our hot chocolate mix is yet another of our growing line of carefully blended lavender-flavored chocolate offerings based on the best of Guittard chocolate bases. Includes miniature marshmallows. After preparing Lavender Hot Chocolate, add a dusting of heart shaped sprinkles to each mug. What child of any age doesn’t love a bath brimming with bubbles? Add a generous amount of our Lavender Bubble Bath to warm running water for mountains of fluffy suds. 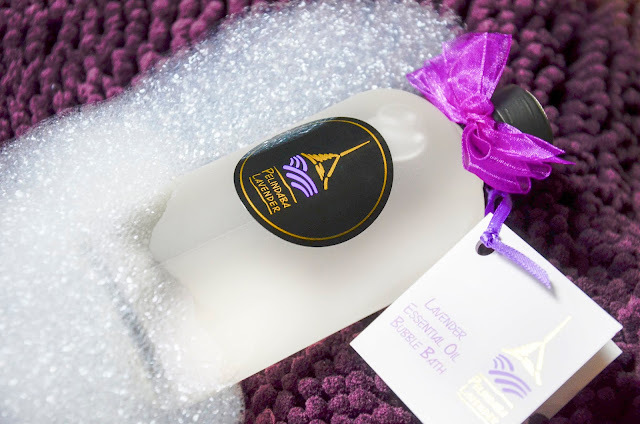 Our wonderfully aromatic Lavender Bubble Bath brings together all the benefits of a broad spectrum of natural plant oils to cleanse and nourish the skin, as well as the soothing, relaxing and fragrant qualities of lavender. To promote restful slumber and heal and re-hydrate chapped skin, at bed time or as needed, coat rosy cheeks with a generous application of our Lavender Treatment Stick. Since the time of St. Valentine of Rome in the 3rd century, lavender essential oil has been known as an effective calming and sleep inducing medium. Formulated in a protective base of beeswax and soothing plant oils for hydration, use of our Lavender Treatment Stick is sure to inspire sweet dreams. So versatile and easy to use, even little hands can manage. Now that the kiddos are in bed, you parents might enjoy a little romantic Valentine's Day date of your own.